A steep road meandering for 12 km (7.5 miles) up the flanks of the mountain ('Doi') leads to Doi Suthep - the beautiful and cool location of Wat Prathat and the Royal Winter palace west of Chiang Mai. The inner sanctum of Doi Suthep Temple is ornately decorated in traditional motifs and rich in dazzling golds. 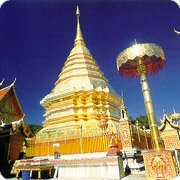 Chiang Mai's most famous landmark: Phra That Doi Suthep Monastery, towering the city from its vantage on Suthep mountain. Chiang Mai is the main handicraft centre of Thailand and the Night Bazaar on Chang Klan Road is the largest centre for the selling of all sorts of crafts in Chiang Mai. The selection is astounding! Almost anything can be purchased here from cheap 'brand replica' clothing, accessories and souvenirs to up-market furniture, designer clothing, silks, silverware, jewellery and wood carving, weaving, textiles, rattan items, ceramics, pottery, and lacquerware. All items on sale on the Night Bazaar are sold at non-fixed prices. The rule is fairly simply - bargain ruthlessly but patiently and politely. Be friendly but firm, and if the stall holder speaks English, engage in light conversation. A little knowledge of Thai can help considerably in obtaining a good price! The Pong Yang Elephant Training Camp is the main destination of a 30 km tour along the Mae Rim-Samoeng route, inside the Mae Sa Valley. Along the road are many tourist attractions like the Mae Sa Waterfalls, the Mae Sa Butterfly and Orchid Farm and the Chiang Mai Snake Farm. 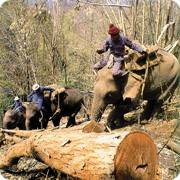 During the 40 minute show, elephants demonstrate their formidable and highly valued forestry skills - moving large teak logs as if they were matchsticks, a skill employed for more than a century in the teak forests of the North. After the show, you amble around on elephant back for one hour. Perched high in a wooden howdah, you gain an impressive view of the forest and an unforgettable experience. Experience both the Northern food and culture at the same time! Kantoke Dinners provide a good way to get to know both the Northern food and culture at the same time. At this event, visitors are seated in the floor around a circular tray with Northern dishes on it and eat while watching traditional Thai and Northern dances and hill tribe culture shows. A Kantoke tray, with all the customary dishes that have enlivened the cuisine of the Lanna for generations. Savour the delicate flavours of a traditional Kantoke Dinner, with all the customary dishes that have enlivened the cuisine of the Lanna for generations. Cruise down rural Mae Ping on a 2-hour journey that will take you past beautiful scenery in the heart of Chiang Mai. Enjoy the pleasant pace of the boat. Stop to visit a local farm and its herb and fruit gardens - or relax and have Thai dinner on board.